Ramon Santiago was called a "hero" by the Lowe's manager who heard his story. It was a moment that captured the hearts of many: A Florida woman tearfully embracing a complete stranger who'd given her his generator after she'd lost out on one of her own in the mad rush before Hurricane Irma. On Thursday, ABC affiliate WFTV in Orlando was at a Lowe's Home Improvement store as residents frantically prepared for Irma. Sanford resident Pam Brekke had driven more than 30 miles from her home to buy a generator, of which the store had received a surprise shipment of little more than 200. Within two hours, though, the generators were gone. And Brekke, who had been next in line to buy one, got nothing. WFTV captured her breaking down in tears in a corner. Enter Ramon Santiago of Orlando. He also saw Brekke crying and insisted that she take the generator he'd carted but had not yet bought. Brekke shared that she'd wanted the generator not for herself but actually for her ailing father who needed it to power his oxygen supply. "I'm worried about this storm," she told WFTV. 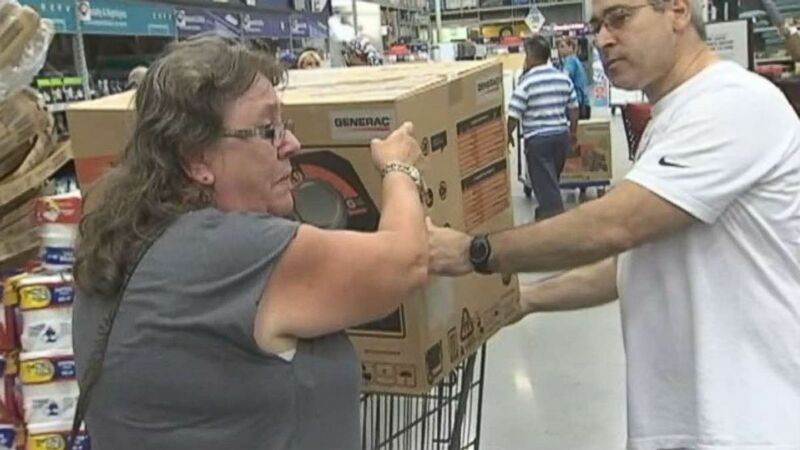 (WFTV) Pam Brekke thanks fellow Florida resident Ramon Santiago after she failed to get a generator at Lowe's Home Improvement store and he gave her his. The two embraced and went their separate ways but their story -- a random act of kindness in the middle of chaos and stress before a deadly storm -- made the rounds not only on social media, but also at Lowe's. When a new generator became available later that day, the store manager told WFTV that she immediately thought of Santiago. On Friday, Santiago returned to Lowe's with WFTV to get his own generator for free from the store. "I wanted to make sure he received it because he definitely deserved it," manager Melissa Rodriguez told WFTV. "He's the hero of the day." ABC affiliate WFTV contributed to this story.